This Darth Vader series is easily my favorite Star Wars series currently running from Marvel and if it isn’t my favorite overall, it’s definitely up there. It has been consistently solid since the first issue and it’s the series that I look forward to the most each month. Soule is one of my favorite modern Star Wars authors, he hasn’t put out a series yet that I haven’t thoroughly enjoyed. I think some people have aspects they don’t love about it but I’ve always also been a fan of Camuncoli’s art, I think he’s one of the better artists that Marvel has on the Star Wars books. This story picks up where the last issue left off: Lord Momin has possessed the assistant to an Imperial architect and designed his own version of Vader’s new fortress. 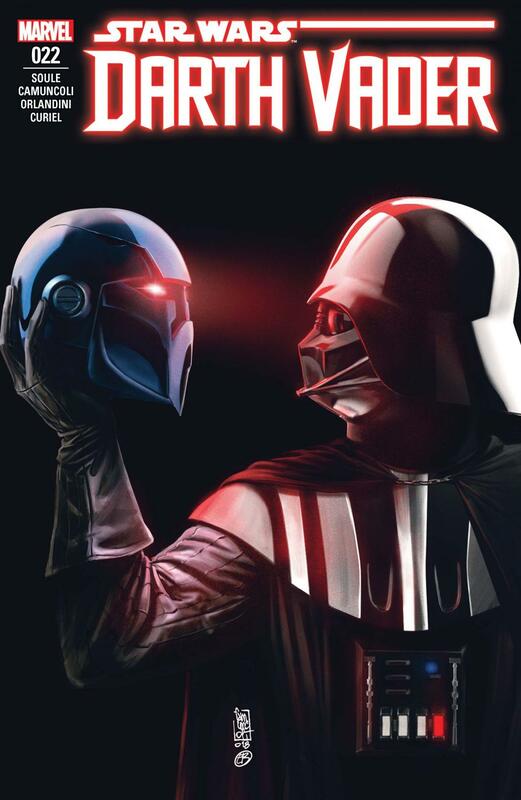 Vader takes the helmet into the Dark Side cave where he corrupted his kyber earlier in the series and gets a lesson about Momin’s history from the spirit inside the helmet. The entire Vader series has been building to this arc since the beginning and we’re finally getting to see the origins of Vader’s fortress, which is pretty exciting. The character of Momin himself has been in the works for the last several years, his helmet and presence being introduced in Soule’s Lando miniseries from 2015. Rereading that series now is very interesting after the context this issue gives to Momin’s backstory. The series never gave the helmet any backstory but it did seem to have a corrupting influence on those around it, causing members of Lando’s team to turn on him. Momin is a great villain, sufficiently made horrifying straight from childhood by the writing (that poor cat). His backstory was very interesting to read about, in part because he was unique among the Sith, never taking an apprentice and not obsessed with fighting the Jedi or ruling the galaxy. I did think that being able to freeze time by channeling the Force into the engine was a bit odd and maybe overpowered but I’m always OK with seeing the Force used to do new and unique things. I’m looking forward to seeing where the rest of this arc goes over the next few months. Momin is making some very interesting promises to Vader that he seems certain he can keep. Judging by the previews, the final issue of Tales from Vader’s Castle from IDW will be featuring the Mustafarians attacking the castle in a story and the solicitations for the next issue of this series hint at the same thing, so maybe we can expect some connectivity between the two series. Can’t wait to find out!